As one of the leading Tibet tour operators online, Tibet travel org has helped thousands of foreigners to Tibet and also gathered an abundance of information on traveling to Tibet from our customers and local Tibetan tour guides. Therefore, we can give our clients professional and updated Tibet travel tips and information. Insider Tips on How to Find the Best Tibet Travel Agency to Run Your Tibet Tour? Insider tips for finding the best Tibet travel agency in Tibet. What you should pay attention to when choosing the Tibet travel agency to run your Tibet tour. Tibet travel is the experience of a lifetime, and can give you a sense of adventure, excitement, and satisfaction. Here Tibet Vista provides you with some useful tips, including how to travel safely for individual travelers to Tibet. There are top 5 common mistakes and misconceptions of Tibet touring, namely, Tibet travel permit application, solo travel in Tibet, influence of altitude sickness, costs of Tibet trekking and cycling tours, best time to visit Tibet. Tibet Travel Org, Tibet Vista Tour, recently released four biggest mistakes that people make about Tibet's Tourism. Misled by the bewildering amount of information on Internet, many foreigners make some mistakes about Tibet. Ultimate Travel Guide to Yamdrok Lake tells you all the useful travel tips for Lhasa to Yamdrok Lake tour, like best time to visit, what to see, photography advice, packing list, etc. Check more about which one is better for different travelers, Yamdrok Lake, Namtso Lake, or Manasarovar Lake? With the lifting of the restriction on nationality and group sizes, it is easy for travelers to get Tibet permit and travel to Tibet in 2013. But travelers are kindly required to make a responsible Tibet tour. Usually, a Tibet tour refers a trip to Tibet Autonomous Region (TAR). In fact, a Tibet tour is not merely limited to the TAR. Let’s figure out the difference between Tibet Autonomous Region and Tibetan Area. According to Tibettravel org’s over ten years’ experience, the Lhasa to Kathmandu tour is the top Tibet overland tour as it allows excellent detours to central Tibet’s famous monasteries, plus views of world’s highest peak. Tibet is a mysterious place that can offer different people different experiences. The following are 20 top Tibet travel experiences rated by LP. Tibet permit or visa must be the first thing you should concern when you are planning a Tibet tour . Tibet Vista's travel guru shows you the most useful guide to what to prepare for a Tibet tour. As we all know, Tibet is located at the top of the world, with high altitude and complex terrain. The climate in Tibet is somewhat harsh. We would like to share a list of useful things you should pack for tour to Tibet, especially clothes. Namtso Lake's touching beauty should not be missed by any traveler to Tibet, but how to get to Namtso Lake to view its beauty? Can the Tibetans Speak English? Tibet is among one of the most attractive places in the world. How to go to Tibet and what to see in Tibet are the most concerned questions for travelers. Click to view the detailed information of Tibet. The Potala Palace, at altitude of 3,756.5 meters above sea level, occupies an area of over 360,000 square meters (about 32 acres), measuring 360 meters from east to west and 270 meters from south to north. It has 13 stories, and is 117 meters high. Kora is a type of pilgrimage or meditation in the Tibetan Buddhist tradition. There are some traditional koras in Tibet, like walking clockwise around Jokhang Temple, Barkhor Kora, circumambulating Namtso Lake and Mount Kailash. If you are a vegetarian and plan to travel Tibet, you don't need to worry about what to eat during your trip in Tibet. There are many vegetarian restaurants in Tibet offering you a wide range of options. You can just specify when ordering. As it is not very easy to get to Tibet for foreign travellers, you shouldn't miss the most wonderful sights in Tibet, no matter it is natural or cultural attractions. The following tourist destinations should be on your list of must-see for your Tibet tour. Here are some FAQs for foreigners to travel to Tibet. Every year, thousands of foreigners flock to Tibet to explore its time-honoured unique culture and enjoy the stunning scenery on the Qinghai-Tibet Plateau. Here are some useful Tibetan words most-commonly used in local people's daily life. Packing for Tibet travel has always been the topic that frequently discussed. Due to the changing climates and varied elevations, how to pack properly baffles most of the travelers who first set foot on this holy land. Follow us to see the tricks in your packing and find the most suitable for you. Is it safe to travel to Tibet? Is social environment is stable? What issues travelers should pay attention during travelling in Tibet? 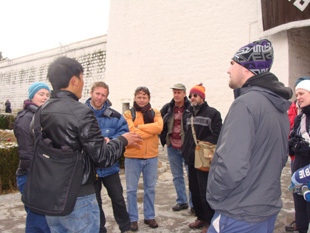 Here Tibet Vista Tour tells you how to stay safe in Tibet and avoid risks during travelling. Tibet is a holy place for tourists all around the world. And travelling in Tibet is a lifetime tour for everyone. With the popularization of smart phones, downloading apps before your trips will make everything easier and more convenient. Here we list five most useful APPS to enrich your trips to Tibet: Wechat, Dianpping,VPN, Googlemap, and Tripadvisor. Most of travelers would like to arrange a Tibet tour as cheap as possible, in my opinion, the most effective way is to arrange your trip in low season – in winter, almost 40% discount of that in peak season. Known as hot springs, Yangpachen has more to offer. The scenery of Yangpachen grassland in autumn is picturesque and harmonious, which you cann't afford to miss. 0 Comment ON "Useful Travel Tips"